Yeah we’re still at Visayas State University and my “Livelihood Tour” continues – a whole lot of learning since yesterday, I may even have forgotten some details. But let’s go to our next appointment, the VSU’s Department of Food Science & Technology. On arrival, we were met by the heads and ushered to a classroom already set-up for a quick presentation. Of? Of things coconut (of course), PLUS, many other things that we usually take for granted but are actually worth venturing into – especially for the rural folks who need to have extra means of earning to sustain an acceptable sustainable economic status. Ah they presented and discussed many things. My friend and her companions, even the DTI officer escorting us, got fascinated and asked about various details. How much more the lowly me, myself and I, right?! Overwhelmed! This country is just so full of ideas, talent and resources. Pero hanggang dyan lang yan hehe! Take the case of the Langka. 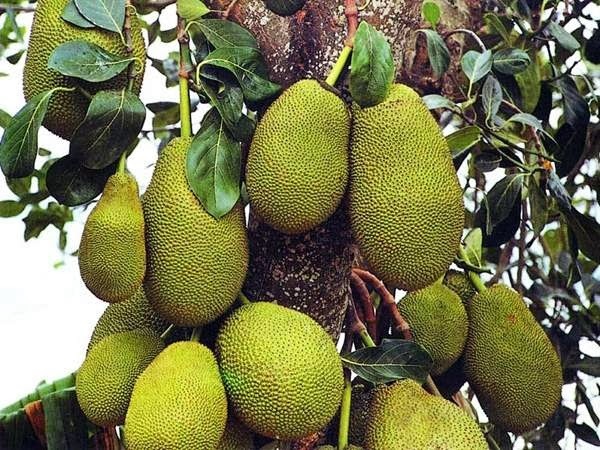 Yep, the jackfruit. It is such a sweet-smelling fruit and not to mention delectable, right? Many of you will agree that the same fruit cooked in coco-milk is also one delectable viand, right? Unfortunately for this fruit there is always a lot of wastage. Why? Because each fruit is normally too big for a family to consume! And each tree would usually bear 3 or 4 enormously gigantic fruits together with other normal sized ones. Even if they sell those in the markets, buyers still waste a big part of the fruit - you eat the ripe yellow part, cook the seeds (sometimes) and throw the white strips after getting just enough to cook as vegetable viand, right? Enter the VSU and their discoveries – the Vacuum-Fried Langka. It’s delicious, not too sweet and not too bland. The yellow or white part does not matter, they taste similarly delicious. When packed in individual snack sizes, they can have a longer shelf life. And not to mention a healthy organic snack! Sarap! I for one like munching them crackly nangka snacks with a sweet after-taste. They're those in dominantly-green packs in the picture below, the yellow ones are 'dehydrated jackfruit'. We all agreed this vacuum-dried jackfruit can even easily go as “pulutan” be it with beer, tuba or any drink for that matter. Interestingly, this kind of junk-food-style snack changes my attitude towards junk-food. How? Well, I have started veering away from junk-food since the dawn of the computer age! Why is that? Because almost all of them are messy on the fingers that we cannot easily go back to our keyboards, right? Can you believe, at times, when the craving is too intense, I eat my cheez curlz or chippy with a fork?! Yeah, even pik-nik with a spoon! But not this vaccum-fried langka! There are no oily nor powdery coatings. You can just pick them with your fingers and pop them to your mouth without worry of your phone or keyboard smeared with food particles or oils! How is that made? I watched in amazement. At first it looked kinda technical, almost rocket science hehe, because it is set in a laboratory with the crews in immaculate white lab-gowns. But listening to the professor explain things, I guess anyone at home can do this. The jackfruit already in bite-sizes is just dumped into a fryer that looks like a pressure-cooker. Just like that, and very quickly! Well, the important thing to learn (probably) will be how is that vacuum-fryer made or where bought. Which the VSU or DTI will be more than eager to help you with. Other than that, a very easy thing to get rich from, I suppose hehe. Wait, I was not listening very well – because I got interestedly distracted by the many things else in this place. But there was that time we were offered a juice drink that came from the same fruit. My goodness what a sweet aromatic thing to ingest! The professors described its nutritional contents to us that made it all the more interesting. I say, it could even be diluted with more water because it is just too sweet as is. Proof? When the pitcher was settled at a table near the door of this big classroom area, some insects (bees and wasps?) were attracted to it and thy came trying to land on the pitcher! Another proof? If your hand touched a drip from the liquid, it gets sticky! If am not mistaken, this juice comes from making the “dehydrated jackfruit”, another product similar in texture to dried mangoes. Oh, am not really sure if the fruit is dehydrated first before frying. Maybe so (I was not listening) because that probably makes them crackly. There was more, but let us talk about them in my next story!